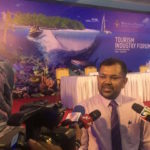 Despite questions over safety for tourists, the Maldives-sponsored international tourism and trade fair ITB Berlin was a major success, Tourism Minister Moosa Zameer has said. Speaking to the press soon after his arrival in Malé, Zameer said Saturday that he had faced many questions over the opposition’s claim that the Maldives was the highest per capita supplier of recruits for the militant Islamic State. But ministers had put in a special effort “to clear up misconceptions” about tourist’s safety, he said. 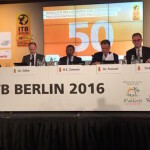 The Maldives was the partner country of this year’s ITB, the world’s largest travel exhibition. Some 280 officials from 95 companies participated in the five-day fair, which will end today. 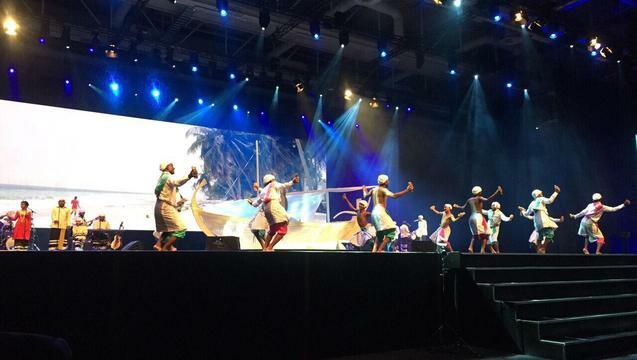 The fair kicked off with a play by 57 Maldivian performers, and a dinner featuring Maldivian food. Some 2,500 people reportedly attended the fair. Zameer was not responding to further inquiries at the time of going to press. Hosting the ITB was part of the government’s Visit Maldives Year 2016 campaign, launched in June with the aim of attracting 1.5million tourists to the Maldives. January posted a growth of 11 percent in arrivals, according to the latest figures by the tourism ministry. However, the average duration of stay declined from 6.5 to 5.6 days, while occupancy rates decreased from 73.3 percent to 70 percent. Growth was slower than expected in 2015. The government had set a target of 1.4million arrivals, but welcomed 1.2million by the end of December. The figure was still a 2.4 percent increase from 2014. However, despite the increase in arrivals, last year saw a decline in occupancy rates and bed nights. Resort occupancy rates fell from 74 percent to 67 percent in December, the month that marks the onset of the tourism peak season. The Maldives Monetary Authority pinned the blame partly on President Abdulla Yameen’s declaration of an unprecedented state of emergency in November. But Zameer, in a January interview with CNBC in Singapore, said the state of emergency, which lasted six days, had no effect on arrivals. The Maldives had not been able to meet targets because of “external factors,” he said. “[L]ike external factors like what happened in the Middle East. Sharm al-Sheikh had its day, you know, even in France there were issues, you know we had tremendous slowdown in French arrivals because of what happened back there in France. So that’s basically why we couldn’t meet that target. But in spite of all of that, we had a 2.7percent growth,” he said. 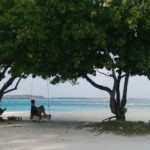 “Again we are very top-notch, the up-market, that effect has, the economic effect is a little less on, mainly for Maldives market, it will be security or else infrastructure,” he said. The existing airport is only able to cater to 1.5million tourists per year, he continued. With the development of the airport and the opening of some 30 resorts under construction, the Maldives could host as many as 7.5million arrivals by the end of 2018, he added. European tour operators who spoke to The Maldives Independent soon after the state of emergency in November said years of bad press over political crises and dearth of mid-range hotels was starting to have an effect on the Maldives’ attractiveness as a destination. Europe accounts for nearly half of all tourist arrivals, while China is the single largest source market, accounting for a third of arrivals.